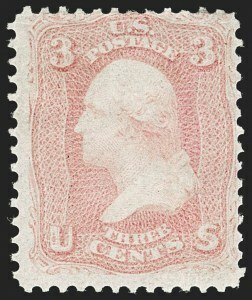 FINE APPEARING ORIGINAL-GUM EXAMPLE OF THE 3-CENT 1861 ISSUE IN THE PINK COLOR. VERY FINE APPEARANCE. 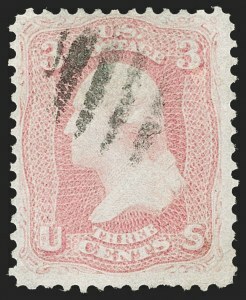 AN EXCEEDINGLY RARE ORIGINAL-GUM BLOCK OF FOUR OF THE 1861 3-CENT PINK. Multiples of this distinctive shade are very difficult to obtain. Apart from the unique plate block of twelve (ex Zoellner) we have offered only four other blocks since keeping computerized records. None were sound. FINE APPEARANCE. 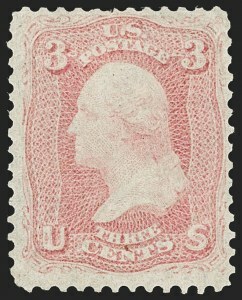 THE 1861 3-CENT PIGEON BLOOD PINK IS EASILY ONE OF THE RAREST OF THE 1861 ISSUE STAMPS TO OBTAIN IN UNUSED CONDITION. WE HAVE OFFERED ONLY ONE OTHER SINCE 1993, AND THE PHILATELIC FOUNDATION HAS CERTIFIED FEWER THAN A SIX. 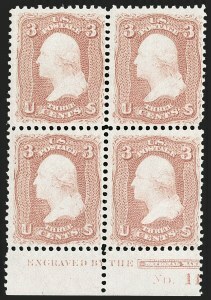 The 3c Pigeon Blood Pink is one of the rarest of all 1861-66 Issue shades in original-gum condition. 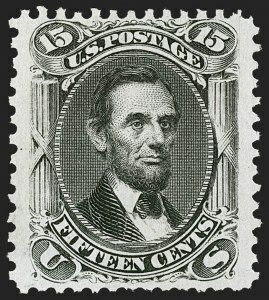 We have offered only three since keeping computerized records, including the Whitman copy in 2009, one with a piece out in 1993, and the stamp offered here. 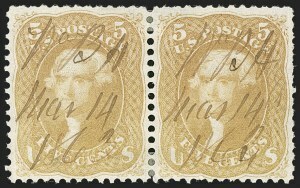 The Philatelic Foundation has certified two others, both with faults and off center, bringing the total to four certified by the P.F. plus one uncertified offered by us in 1993. The P.F. has also previously certified one other as genuine, but it was withdrawn when resubmitted and so needs to be reexamined. 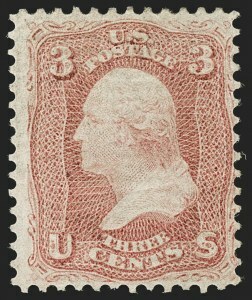 The Miller collection (owned by The New York Public Library and now displayed at the Smithsonian National Postal Museum) contains another, but it is not available to collectors. With 1958 and 2018 P.F. certificates. The Pigeon Blood Pink shade was first listed in Scott in 1957. VERY FINE-EXTREMELY FINE. 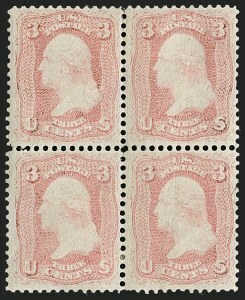 AN OUTSTANDING QUALITY PLATE BLOCK OF EIGHT OF THE 3-CENT ROSE 1861 ISSUE. 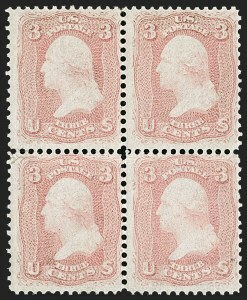 Imprint and plate number blocks of the 3c 1861 only come from the bottom of the sheet. EXTREMELY FINE. 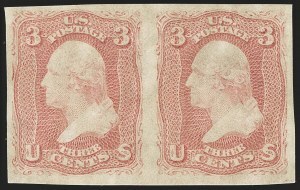 A BEAUTIFUL PAIR OF THE 3-CENT 1861 ISSUE IMPERFORATE HORIZONTALLY. ESPECIALLY DESIRABLE WITH SUCH A WIDE TOP SHEET MARGIN. 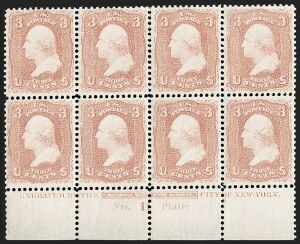 We have been able to assemble most of the top row of the Imperforate Horizontally sheet from examples in our records. It appears likely that these were first separated along the perforations into vertical strips and then were then cut apart along the imperforate side. 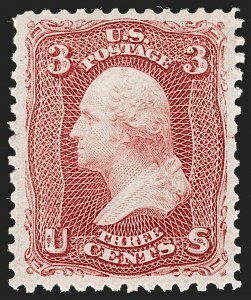 The number of 3c Imperforate Horizontally originally found is not known, but they are very rare in any form. Most examples we have seen are without gum. 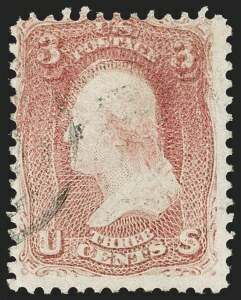 The last example we offered was in 2014, and prior to that one has to go back to our 2009 Whitman sale to find another. VERY FINE. 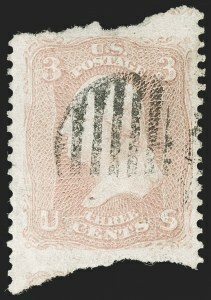 THIS IS THE ONLY RECORDED USED EXAMPLE OF THE 3-CENT ROSE IMPERFORATE HORIZONTALLY. 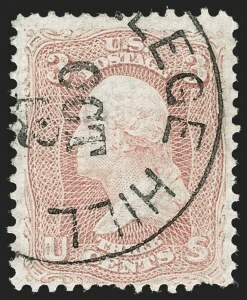 The size of the margins and the method of separation, with parts of the adjoining stamps at top and bottom, are conclusive evidence that this stamp never had horizontal perforations. FINE APPEARANCE. 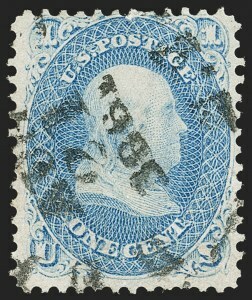 A RARE EXAMPLE OF THE 3-CENT 1861 ISSUE PRINTED ON BOTH SIDES. OUR CENSUS CONTAINS ONLY TWELVE USED AND THREE UNUSED COPIES. 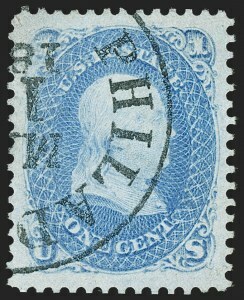 ONE OF THE GREAT RARITIES OF THE 1861 ISSUE. 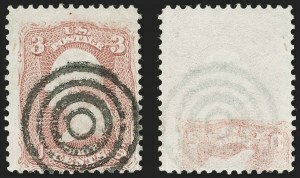 The 3c 1861 printed-on-both-sides stamps are known with the orientation of the back impression the same or inverted in relation to the design on the front, which indicates that more than one sheet was printed. The inverted impression on back is a result of the sheet being turned 180 degrees before it was put on the press the second time. 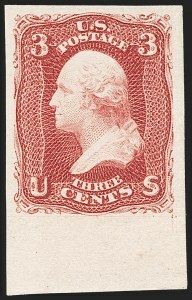 The three unused and four of the used are known with the back printed inverted in relation to the front (one is in the Benjamin K. Miller Collection at the New York Public Library). 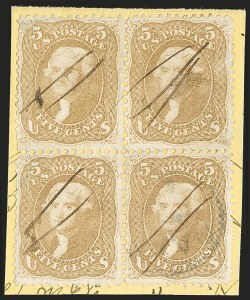 Our census of Scott 65 printed on both sides, available at our website at https://siegelauctions.com/census/us/scott/65e , contains three unused and twelve used examples (including one in the Miller Collection). As the census indicates, most of these are in poor condition. Short perfs and rounded corners are the most obvious flaws. One is reperfed. The example offered here is in far better condition than most. FINE AND RARE. 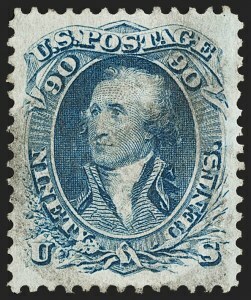 ONE OF ONLY EIGHT EXAMPLES OF THE 3-CENT 1861 ISSUE DOUBLE IMPRESSION KNOWN TO US, OF WHICH ONLY TWO ARE SOUND. ONLY FIVE HAVE BEEN CERTIFIED AS GENUINE BY THE PHILATELIC FOUNDATION. A GREAT RARITY OF THE ISSUE. Most double impressions occur when the first impression is made and found to be inadequate. The paper is then put in the press a second time, where it receives the heavier impression. It is a common misconception that the weaker impression is the second one. 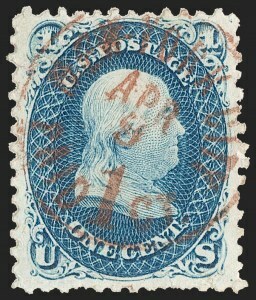 Our census of Scott 65f, available at our website at https://siegelauctions.com/census/us/scott/65f , records only eight copies (including one in the Benjamin K. Miller Collection at the New York Public Library). None are known unused. 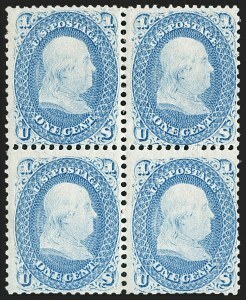 Six have been certified as genuine by the Philatelic Foundation, including one repaired with portions of design added. Another was stolen from a Fedex package several years ago and is still missing. 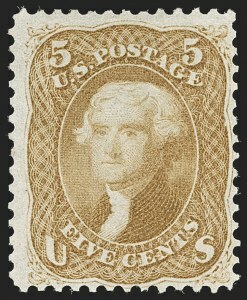 This leaves only five certified and one uncertified available to collectors. The example offered here, with superior centering and showing clear doubling of the design, is one of the finest contained in our records -- only one other is sound, offered in our 2012 Natalee Grace sale. Census No. 65f-CAN-05. With 2001 P.F. certificate. This is the first we have offered since our 2012 Natalee Grace sale. FINE. A SCARCE SOUND UNUSED EXAMPLE OF THE 1861 5-CENT BUFF. FINE APPEARANCE. 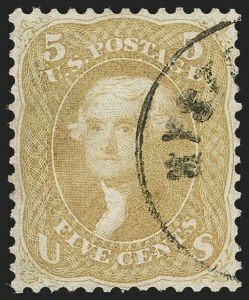 A SCARCE EXAMPLE OF THE 5-CENT 1861 BROWN YELLOW SHADE WITH PART ORIGINAL GUM. 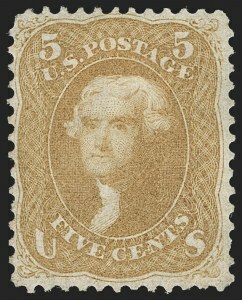 The 5c Brown Yellow and its shade varieties (Buff and Olive Yellow) are recognized as the rarest of 1861-66 Issue stamps in original-gum condition. We have offered fewer than a dozen unused examples in any condition since keeping computerized records. FINE-VERY FINE APPEARANCE. 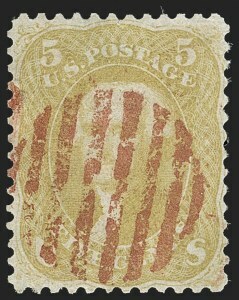 THIS IS THE ONLY RECORDED BLOCK, EITHER UNUSED OR USED, OF THE 1861 5-CENT IN THE BROWN YELLOW COLOR. ONLY THREE BLOCKS OF FOUR ARE KNOWN FOR BOTH THE BUFF AND BROWN YELLOW SHADES, AND NONE ARE SOUND. A GREAT RARITY OF THE ISSUE. We are aware of three blocks of four of either Scott 67 or 67a. None are known for Scott 67b. 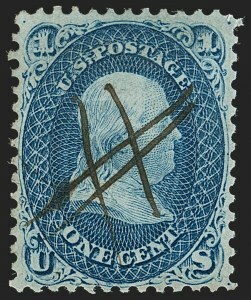 The blocks are: 1) Scott 67 with original gum, bottom stamps with crease and one stamp small repair, ex Ishikawa; 2) Scott 67 with blue grid cancels, perfs expertly rejoined, ex Zoellner; and 3) Scott 67a, pen cancels, small faults, ex Klein, the block offered here. 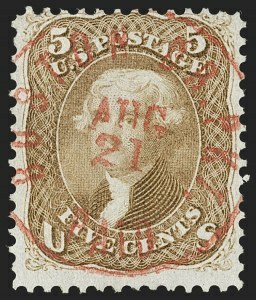 The Philatelic Foundation has only certified the one unused block.